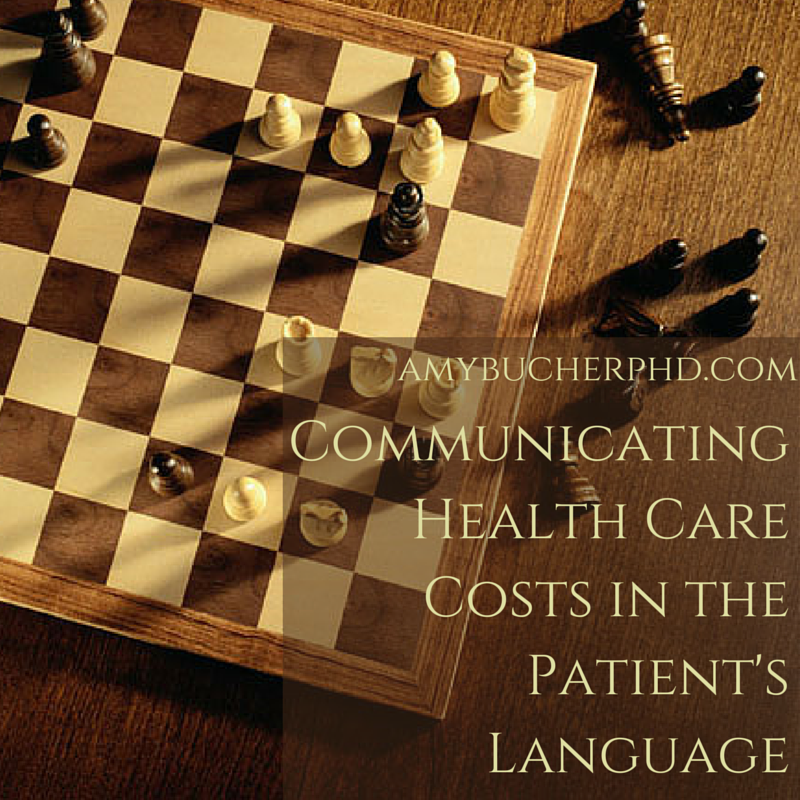 Communicating Health Care Costs in the Patient's Language | Amy Bucher, Ph.D.
How much should you pay for a surgery? How about for an in-office treatment? How do you know what a good price is? The reality is that the price of the same medical procedure can vary greatly, sometimes because of common-sense factors like location and provider, and sometimes for no obvious reason at all. If patients can see how much a procedure costs at different facilities, they can make a more empowered choice about which treatments to have and where to have them. As health care reform shifts some financial burden onto patients for their care, price transparency is growing in importance. Some states have laws governing price reporting by providers, while the Affordable Care Act mandates price transparency for insurance coverage through its sunshine provisions. Transparency does seem to work. When patients have access to price information, they tend to save money on health procedures. The problem is that many comparison tools for health care costs aren’t written in a language designed to meet patient needs. Results for searching “knee” on Clear Health Costs. I think I’m pretty savvy, but I have no idea what the difference between 29850 knee arthroscopy/surgery and 29875 knee arthroscopy/surgery is*, which one I might need, and whether I should be trying to get one instead of the other. Clicking through doesn’t give me any more information. Unless I have my paperwork from the doctor’s office in front of me (and that’s assuming their HCPCS codes are on the patient-facing forms), I’m probably not going to get the maximum level of use out of this tool. It’s not written in my language. This speaks to the need to target if not tailor health-related communications, both to help people manage their health and to help them navigate the healthcare system. 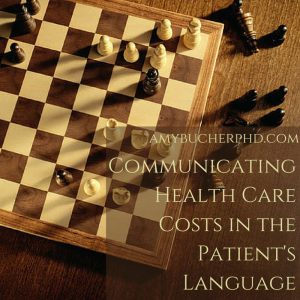 Just as with health education, effective communication about price transparency in health care requires that hospitals and health plans speak a patient’s language. For the knee example above, one solution is to use non-medical terminology to describe the procedure I need. At the very least, if the transparency tool had included a brief explanation of the procedure in layman’s terms, I might have been able to gauge if it was the right one. Images or diagrams might also help here. Another partial solution is rebundling the costs that get unbundled in the transparency process. Seeing the price of my knee surgery doesn’t tell me the price of the pain medications I will be given or the room where I will stay. Including commonly grouped items together in the transparency guide (similar to how Amazon recommends additional purchases based on what’s in your cart) could help me better grasp my overall costs. The Healthcare Bluebook does a little of this; it could do more. Some experts also suggest pairing costs with quality ratings, to help consumers understand that not all versions of the same procedure are created equal. Quality ratings can help patients see if the extra money they’re spending on a surgery is going toward an improved outcome, or just more overhead. Leah Binder points out that lower quality procedures may end up costing more in the long term if they lead to poorer outcomes or complications. It’s getting better. And we can make it even better than that. *I looked it up: The knee arthroscopy/surgeries described by 29850 and 29875 affect different parts of the knee. Do Smart People Make Dumb Patients? 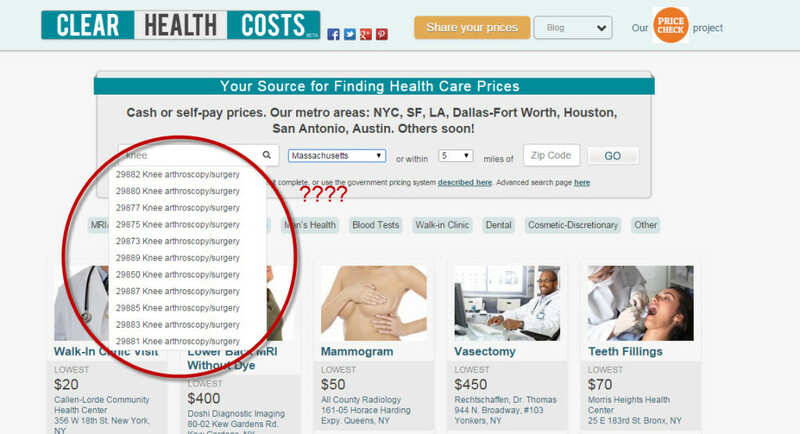 Spotted: Another new cost comparison tool online.